Yeovil Town: Where did it go wrong? In just 895 days Yeovil Town have gone from their greatest moment to a fight to stay in the Football League. On 19 May 2013 they were celebrating promotion to the Championship for the first time in their history. But Saturday's 3-2 defeat at Carlisle saw them fall to the foot of League Two for 24 hours before being replaced by Dagenham following their 2-0 loss against Luton. Successive relegations and a woeful start to the 2015-16 season sees them facing one of the toughest periods of their 120 year history. 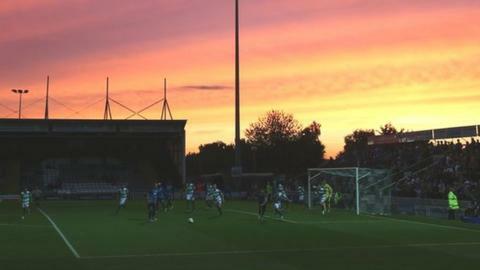 So, just where did it go wrong for Yeovil Town? For some Yeovil Town fans their victory in the League One play-off final over Brentford is a moment they would never forget, a standout day in their history. But chairman John Fry believes it was the beginning of the end. "When we came into that Championship I could see what was coming," he said. "I was probably the one person that day when looking around at the celebrations and I thought 'hang on a minute, we have to get the money in here'. "Probably my biggest regret is I could not think of a way. My key worry was making sure this club did not go broke. "We did very well in the Championship. We competed and we competed well but we just didn't quite have it. We took on the big boys and they respected us for it. It's a moment in history but it has cost us dearly." Where has it gone wrong? Yeovil suffered back-to-back relegations finishing bottom of the Championship in 2013-14 and 24th in League One the following season. Gary Johnson, who had three promotions in two spells at the club, was sacked in February 2015 with the club bottom of the third tier. Terry Skiverton had a short 13-game spell in charge back at the club, before Paul Sturrock took over but he could not stop the Glovers dropping into League Two. "To get into the Championship was an absolute miracle for a club of this size," said Fry. "We have a board of directors that are very committed to the club and we have had to work to the regulations of the Football League and they are tough. "We have hit the world of Financial Fair Play, you can spend so much, but you can't spend beyond that. "When you've built a team for the Championship and the salaries they would have been paid to the revenues you get in League One and League Two, you have to change things. "You have to terminate contracts, get people off the books and I'm telling you it's an absolute nightmare in trying to develop your business, because all the time you are having to change people." Yeovil's defeat at Carlisle on Saturday was their 11th loss of the season - the most in the Football League at present. Despite the club seemingly in free-fall and currently three points adrift of safety, Fry has faith in Sturrock. "I think people have to understand this management merry-go-round is a joke," Fry said. "It's people's careers. "You have to understand your manager. There is more to winning on that pitch, there is no overnight success in this game. "It's disrespectful to the club to tell someone they are not good enough if they are not given a chance." Fry has come under some pressure from fans to quit the club recently but he does not take it to heart. "I have a hearing aid so I switch it off," he joked. "I don't take any notice, I have broad shoulders. It's a free world and it does not bother me. From my point of view we have to keep the customers onside. "I've done this club service for 20 odd years free of charge. I will leave this place with pride in what I have achieve, in what my staff have achieve and what we have built. "The door to the boardroom is always open. I do not want abuse. If fans have got anything to say come and see me, but don't meet in a mob. Come in here and see me and I will try and progress things." So where can the club go from here? After rubbing shoulders with the likes of Leicester City, Derby County, Nottingham Forest and Queens Park Rangers a little over a year ago, the Glovers now face the prospect of dropping out of the Football League. Fry said: "We put in an academy this summer which has been a big thing with the football club. We had one team in the Championship. We didn't have a reserve team, we didn't have a youth team. "We have fantastic supporters, the core support. In a town of Yeovil's size of 42,000 that is absolutely brilliant. That's not to say we can't do it again. "In order to get to where we want to get to we have to make changes. Whether that is at the top or within the team or the staffing or putting in new resources time will tell. "We have to stick with it and the fans have to stick with it. The sooner the first team can turn it around the better and we have to turn it around or we will be a National League club. You've got to keep people believing. "My biggest legacy will be to leave this club in the league with completed facilities. I'm working just as hard to get these plans in place for this club. "As Brian Clough would say, you plan for the following Saturday, you're as good as your last match so we are planning to see if we can turn things around."